Police are asking for help in identifying two persons of interest in a series of auto burglaries on the west side of San Mateo earlier this month. 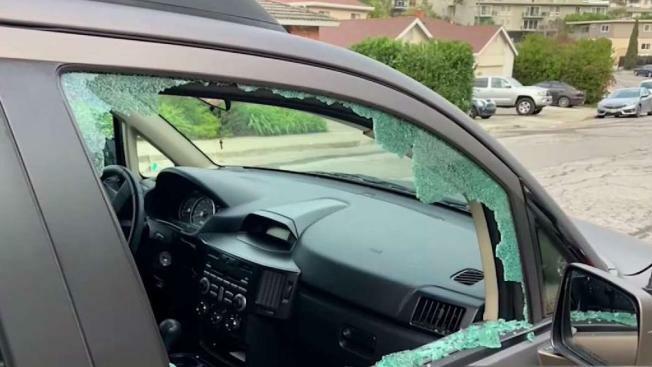 On Jan. 19, thieves targeted cars in the area west of Alameda de las Pulgas to Campus Drive and south of 28th Avenue to West Hillsdale Boulevard, police said. Thieves broke into the vehicles by smashing windows, or possibly the cars were left unlocked, police said. Lawrence Castillo’s family SUV was one of the targets. Thieves broke the passenger window. "This is the first time something has happened, so it's frustrating and annoying," Castillo said. "I pulled the car in here, cleaned up broken glass. It was a pain because regardless of how you clean it, it'll never be that clean." Police said the suspects stole small items: phone chargers, loose change and at the Castillos a fake designer tissue case. "So whatever's in the victim's car they can actually fit in their backpack is what they're taking," San Mateo police Officer Michael Haobsh said. The suspects appear to be male, about 5 feet, 6 inches to 5 feet, 8 inches tall, with slender builds. One suspect was wearing a distinctive small shoulder-backpack style bag with reflective panels on the back. The suspects were wearing lighter colored sweatpants, hooded sweatshirts and what appeared to be white tennis shoes. "Many of these crimes are crimes of opportunity," Haobsh said. "We encourage our citizens to empty their cars completely, make sure they're windows and doors are locked." Anyone with information on the identities of the two men is asked to contact Sgt. Lee Violett at (650) 522-7650 or by email at lviolett@cityofsanmateo.org. Anonymous tips can be submitted to http://tinyurl.com/SMPDTips or by calling (650) 522-7676.